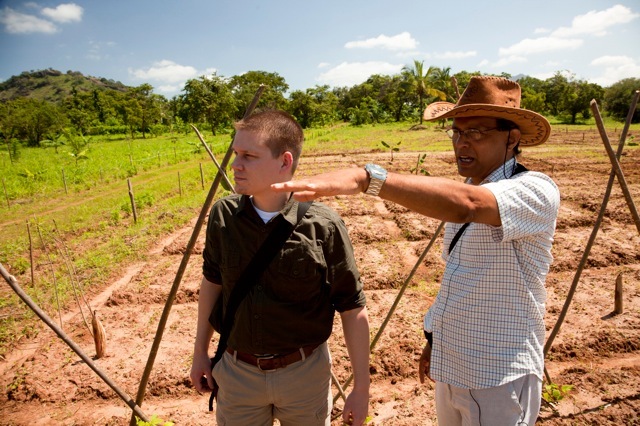 Today’s post is by Frontier CEO Tony Bedard, who accompanied Purchasing Manager Kai Stark to visit Well Earth partner SOFA, the Small Organic Farmers Association, in Sri Lanka. 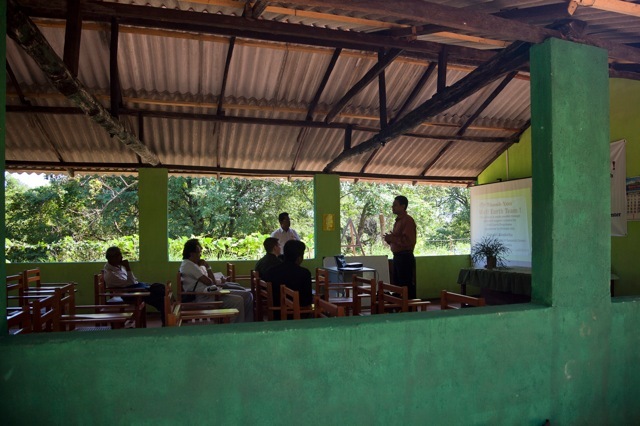 For more about SOFA and the Frontier-funded Training Center there, see our website article, Organic Training in Sri Lanka. At least once a year I try to make a sourcing trip with a member of our purchasing team. I not only get a better understanding of the work of our purchasing staff, but the trips give me firsthand knowledge of our relationships with our grower partners. I can then share what I learn with our employees, our board, the media, and our customers. Early this year, I accompanied Kai Stark on a trip to Sri Lanka — an island nation off the southeast coast of India. Sri Lanka is roughly half the size of Iowa with seven times as many people. Until 1972 it was known as Ceylon — the source of true Ceylon cinnamon. Sri Lanka is the center of the Buddhist religion and culture. It’s a very beautiful island with lush tropical forests and a very diverse landscape. It’s also said to have beautiful white beaches, although we didn’t get to see any of those. The island was prized for its location on a main shipping route early on, and it was colonized by the Dutch, then the Portuguese, and finally the British before gaining its independence as Sri Lanka in 1948. I guess this partly explains why they drive on the wrong side of the road (to us, anyway). Sri Lankans showed us time and again that they had no problem passing into oncoming traffic or driving on the shoulder of the road. It takes a lot of travel time to get to and from Sri Lanka. On our trip home, we left at what was 9:00 AM Saturday morning back home in Iowa and arrived here at 10:30 PM on Sunday night, worn out by two ten-hour flights, a couple long layovers and another two-hour flight from Dallas. After a similar long flight on the way there, we landed in Colombo and drove to a city called Kandy, where we met with our supplier partners. The company has a number of facilities around the city of Kandy that process and package cinnamon, cloves, lemon grass, ginger, nutmeg, and teas along with a few other spices and herbs. While we found their plant and facilities to be very nice and the employees extremely positive, it was even more impressive to see the network of over 2000 small organic farmers — most of whom farm less than two acres of land to support their families. While in the fields, we saw how the farmers grew and processed the nutmeg and cinnamon that we buy. We’re glad that Frontier’s purchases allow the farmers to earn a 10-15% premium for growing organic products. One of our primary goals for the trip was to check on the progress of a new training center near Dambulla, in the central part of Sri Lanka. The training center includes roughly 100 acres of experimental farm ground where growers can get both classroom and hands-on training in growing organically and bio-dynamically. During the first year after the center opened, over 120 farmers were trained — some from as far away as Pakistan. It was a joy and a privilege to see firsthand the impact that our business with them has on the growers and other workers and their families and communities. We can all be proud that our work here at Frontier has such a positive impact on people halfway around the world. Check out the Frontier website for more information and a video about this sourcing trip to Sri Lanka. 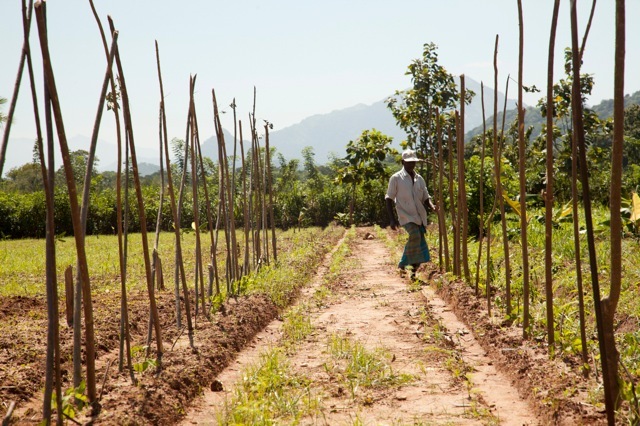 One of Frontier’s valued Well Earth™ partners is the Small Organic Farmers Association (SOFA), a 2,043-member cooperative of small scale, organic farmers in Sri Lanka. The president of SOFA, organic farmer Bernard Sri Kantha, is proud to tell us that the cooperative is founded not only on the principals of organic agriculture and Fair Trade, but also on that of shramadhana — a Sinhalese word for the giving of one’s self, whether time, energy, knowledge, experience, wealth or physical labor, to help improve the welfare of the community. 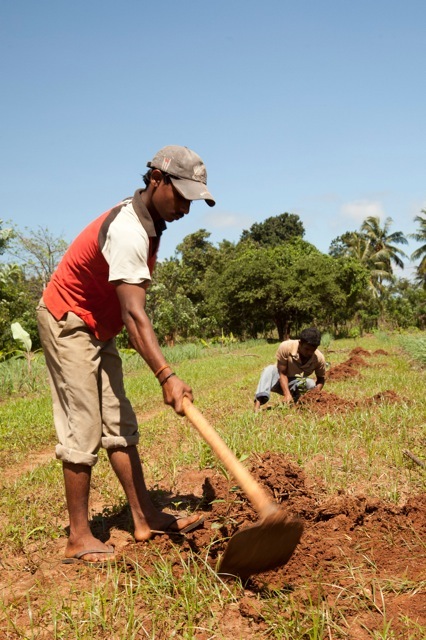 In the spirit of shramadhana, Frontier donated $25,000 in Well Earth™ grant money to support the construction of an organic training center in Sri Lanka. Completed in late 2010, the first classes are already underway, educating farmers on sustainable cropping techniques such as composting, erosion control, rain harvesting, and natural pest management. Aside from offering participants a classroom setting, the training center is also a fully functional research and development farm, allowing students to immediately put their education to use with hands-on field demonstrations and exercises. Co-op members like Mahinda Karunarathna, the father of two children, exemplify this ideal. Mr. Karunarathna grows pepper, cinnamon, cloves, nutmeg, ginger and a myriad of other spices on just a few acres of mountainous land, along with tending a rice paddy and keeping chickens to feed his family. Although his farm and family life are enough to keep him busy, he makes time to share his experience and expertise in sustainable farming methods with other local growers. The result? 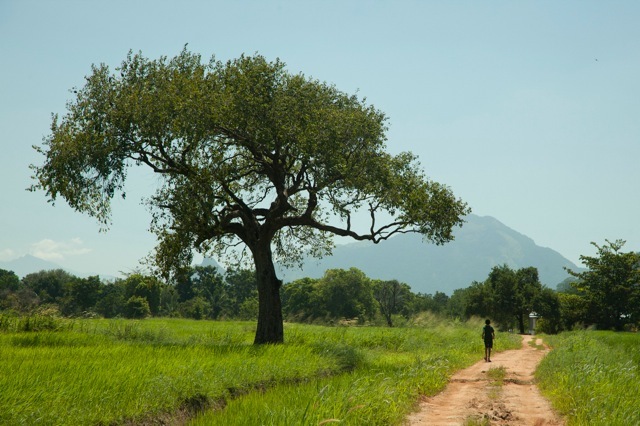 During 2010, the cooperative earned a total of $150,000 in Fair Trade social premiums. For communities where farmers typically earn $900 to $1,200 annually, these premiums have enabled the construction of clean water sources and schools, as well as funded scholarships, education programs and a vast array of other beneficial projects. And while the premiums have made the financial aspect of these programs possible, it has been the volunteered time and effort of people like Mahinda Karunarathna that have ultimately made these things a reality. As always, we invite you to read more about our Well Earth™ program. We created it with you in mind.